During the cultural program in Kuala Lumpur, the show was held outdoor. It was very hot on the day and the floor was also burning hot. Actress Priyanka Karki and the team had to perform on the heated floor. 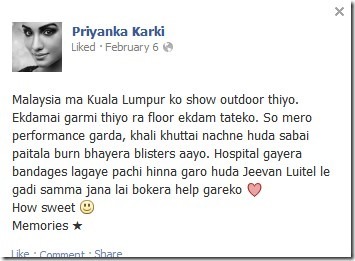 Priyanka danced bare foot on the floor and burnt her feet. After the dance show she realized that she had blisters in her feet. He had to go to the hospital to get treatment. After the bandages actor Jiwan Luitel had to carry her to the vehicle as she couldn’t walk. This entry was posted in Gossips, Photo Gallery and tagged Jiwan Luitel, Malaysia, Priyanka Karki. Bookmark the permalink.